You can omit roasting the onions, but try it at least once with them roasted – the flavor really adds to this dish. The sweetness of the onions and mango plays well with the dressing. In the summer I switch it up a little and grill the components (onion, mango and avocado), and sometimes add grilled corn. I'm not a huge fan of heat in my dishes, so I don't call for any here, but spicy-fans may want to throw in a little minced jalapeno or chile pepper. Cook the quinoa: In a saucepan, bring quinoa and water to a boil. Reduce the heat to a simmer, cover, and cook until most or all of the water is absorbed, about 12-15 minutes. The little "tails" should pop free from the grain and it should still be pretty chewy. If any liquid remains, strain the quinoa. I usually add it to a strainer either way and rinse it under cold water to stop the cooking process, then continue to fluff it every so often as I'm preparing the other ingredients. Toss onion slivers with 1 tablespoon olive oil, salt and pepper. Roast for about 30 minutes. Resist stirring until they begin to brown, then stir occasionally; not too much or they will not brown as nicely. Remove when they are soft and nicely colored. Let cool. Make the dressing: Whisk the olive oil into the lemon juice. Whisk in the ginger and add salt and pepper to taste. 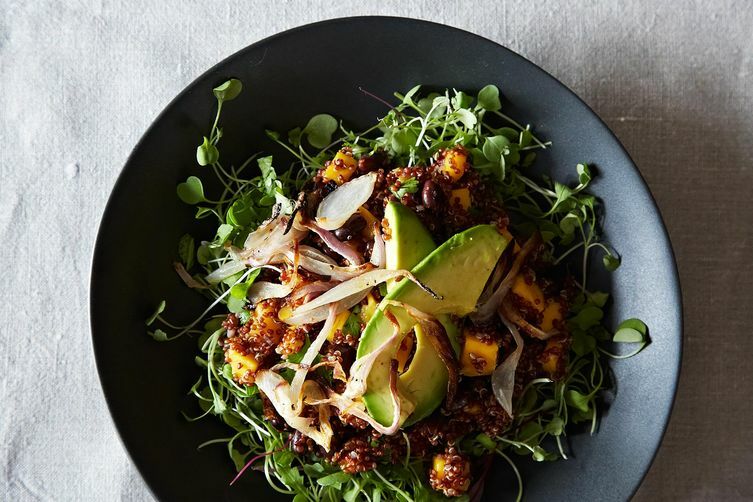 Assemble the salad: Mix the quinoa, mango (and juices), black beans, and cilantro together. Spread the micro greens on a large plate and layer the quinoa mixture over the greens. Top with the roasted onions and the avocado slices. Drizzle the dressing over the salad and serve.